thank you thank you! 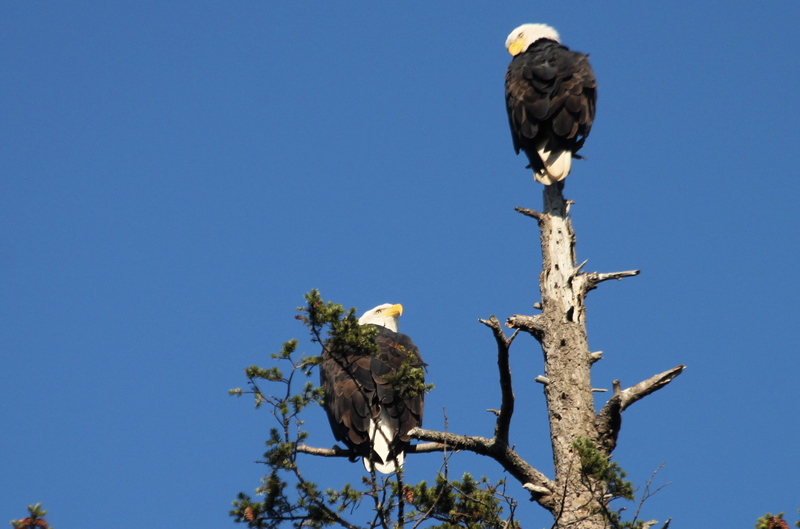 you two are amazing sharing our friends there on Hornby! So glad they have returned! Thank you for the pictures Boonibarb & Wren. I really love them!! Nice to see mom/dad and they look wonderful. It's wonderful to see our favourite couple back home for the winter, safe and sound! Thanks, Booni and Wren, for sharing your photos and observations!!! i went to Grassy Point & then down to Hidden Beach today looking for Mum & Dad. 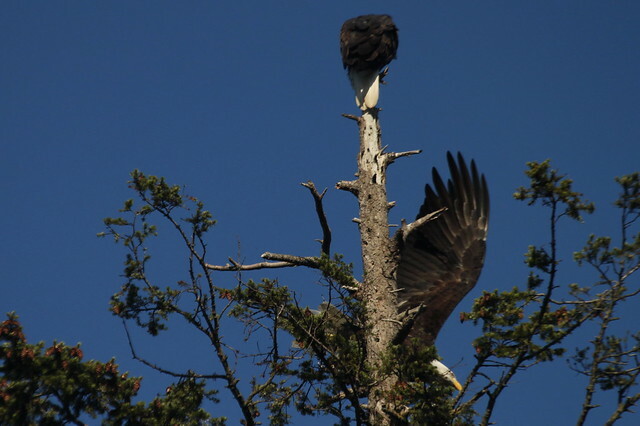 i found this Eagle in the Peters* Tree. This is the Tree viewed from the Hidden Beach area, which is to our right, looking out through the cam. This afternoon I was gardening and minding my own business when suddenly... I heard 2 sets of trills! 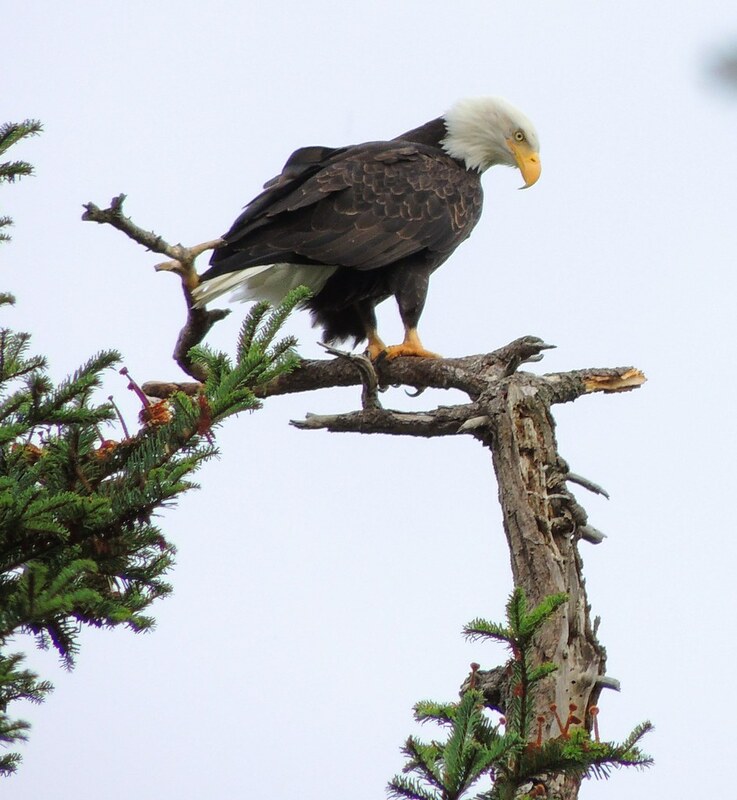 One set started with what I call a 'warning whistle', a sound that most of the island eagles do, but that I've never heard from Mom and Dad. (Mom cachunks instead, and Dad just doesn't do it.) The second trill sounded higher maybe, but I'n no longer certain. For sure those sounds will be on the recording from the cam. I biked over to the nest neighbourhood to see what was up! There were 2 eagles on the Babysitting Tree. 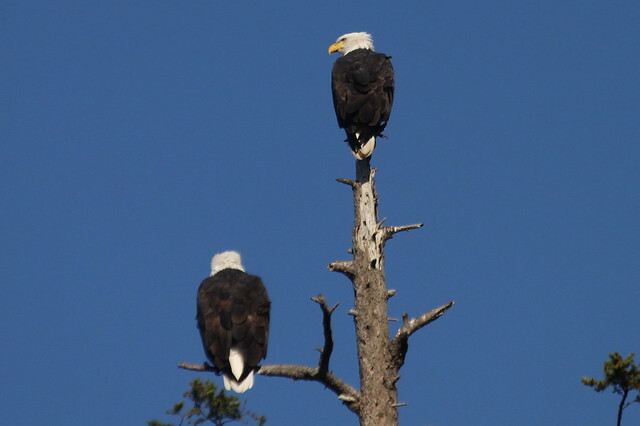 The one on the top was quietly preening, and the one sitting lower seemed kind of fidgety, not relaxed like the other one. 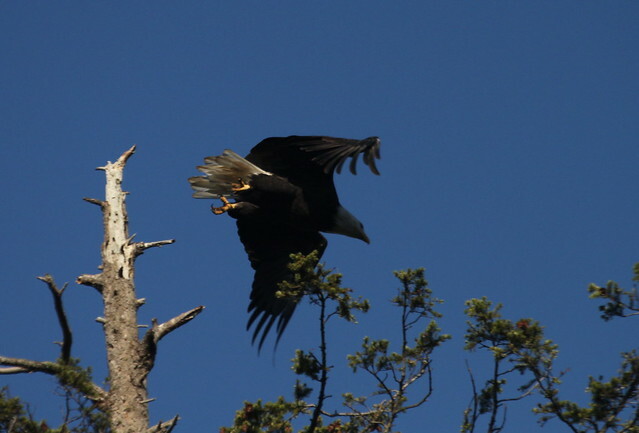 I took a series of photos but I'll start with the last ones because they give an identifying wing print for both eagles. 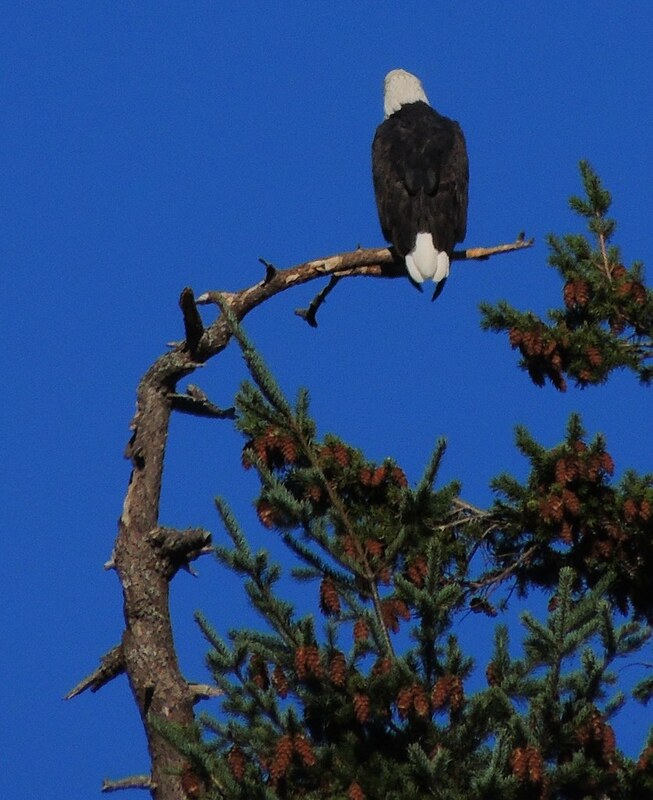 First of all, I refer you to my pics of the eagle taking off from the Peters' Tree on October 5th. Click here to see that post. 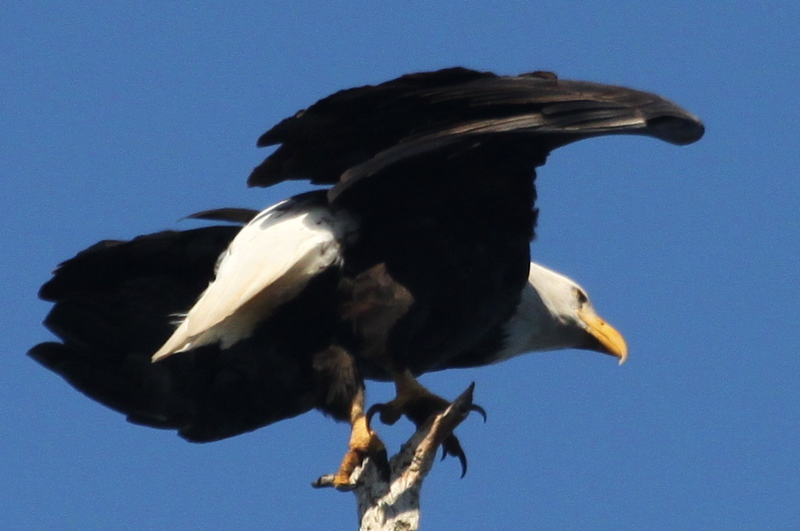 In those pictures, you can see the eagle has new first and second primaries, and a freshly moulted tail, with half the feathers still shorter. 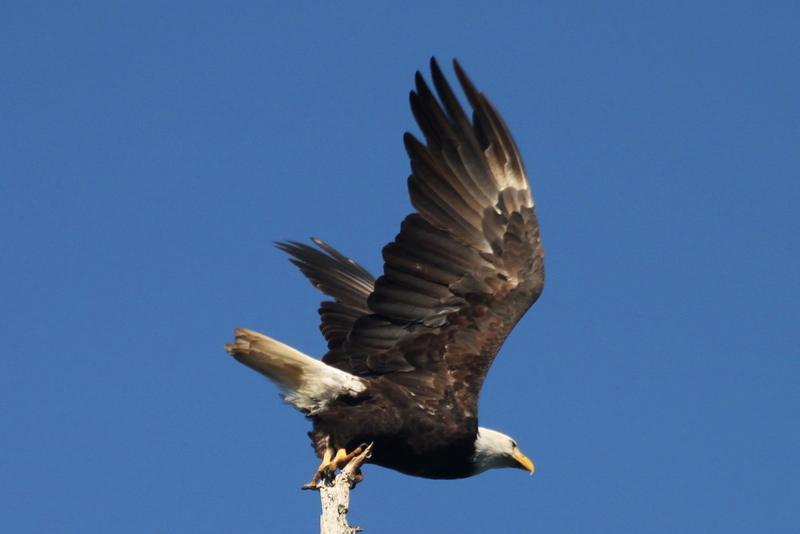 Here's the first eagle of today's sighting, taking off from the lower perch on the BST. The FIFTH primary is moulted... So, not the same eagle. 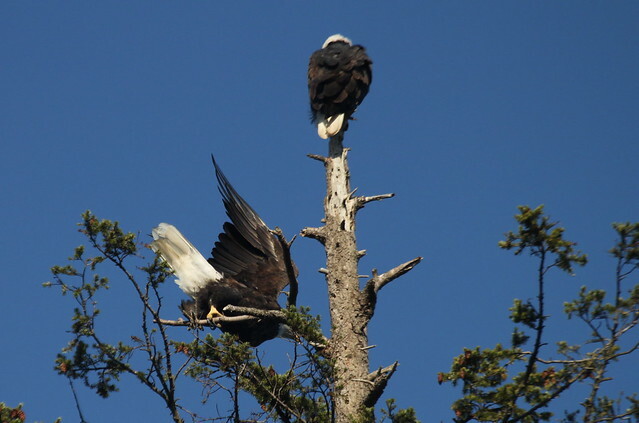 A minute later, the second eagle took off from the Babysitting tree. ...But the THIRD primary is moulted! So NEITHER of these eagles is the one I photographed on October 5th! 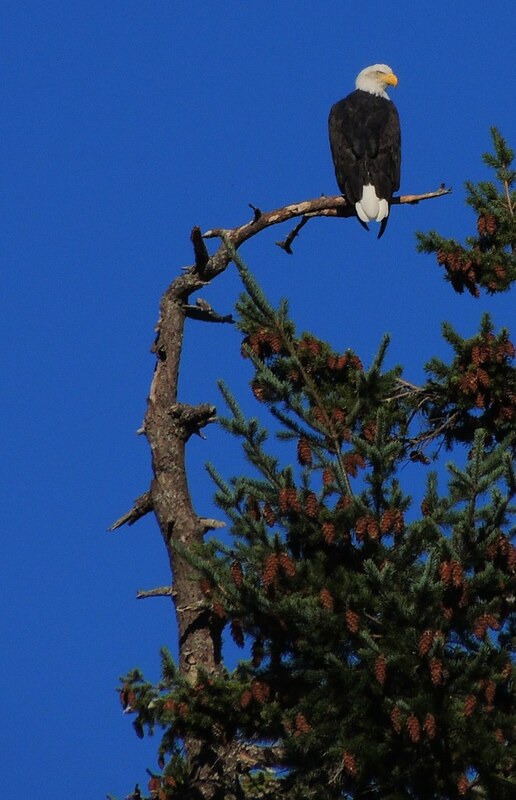 On the first 2 pics, my focus was on the top eagle. He was very relaxed and spent most of the time preening. He's sitting with one foot higher than the other, so that would explain why his primaries are hanging unsymetrically. He has no staining on his head feathers. His tail has some staining. It looks too pale to be a youngster's colouring. You can see some of the toes of his right foot. He's resting his open foot on the top of the tree. 4:24 Stretching after a preen. 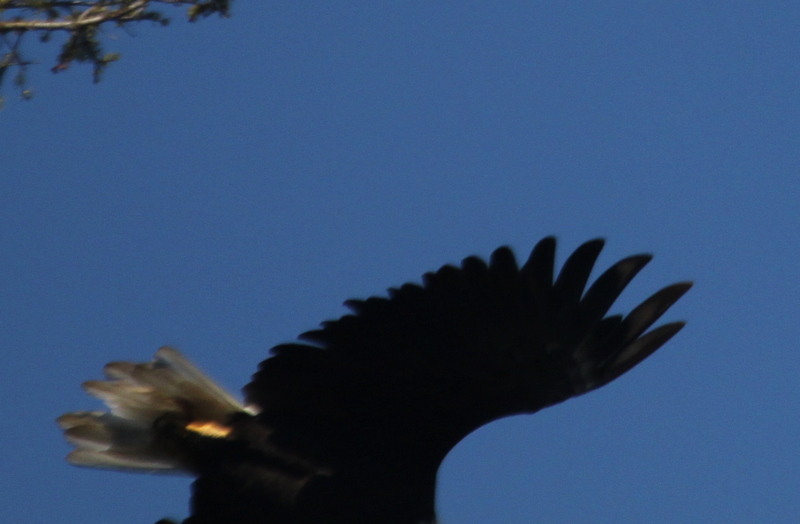 In these 2 pics I focused my lens on the bottom eagle. The pics are a tiny bit overexposed, but I don't see any staining or leftover immature head feathers on this eagle either. Or maybe the faintest bit? Sigh. 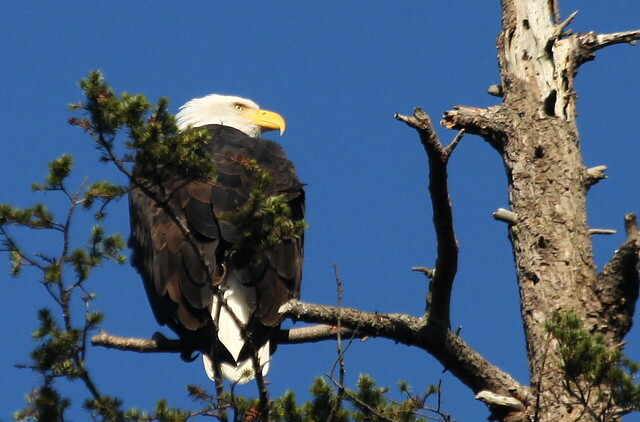 After two visits to the area, I'm now convinced that this eagle is indeed MOM! I take it back. I'm no longer certain of anything. I think I'm gonna camp on the confusion couch for a while. 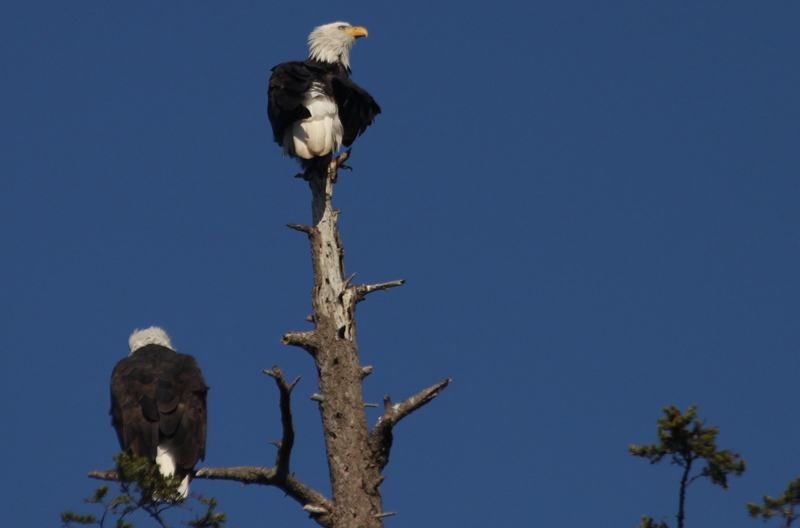 After the two eagles left the babysitting tree, I spotted a pair on the Wiig Nest's perch tree. The cam footage seems to indicate that the two eagles had headed that way! 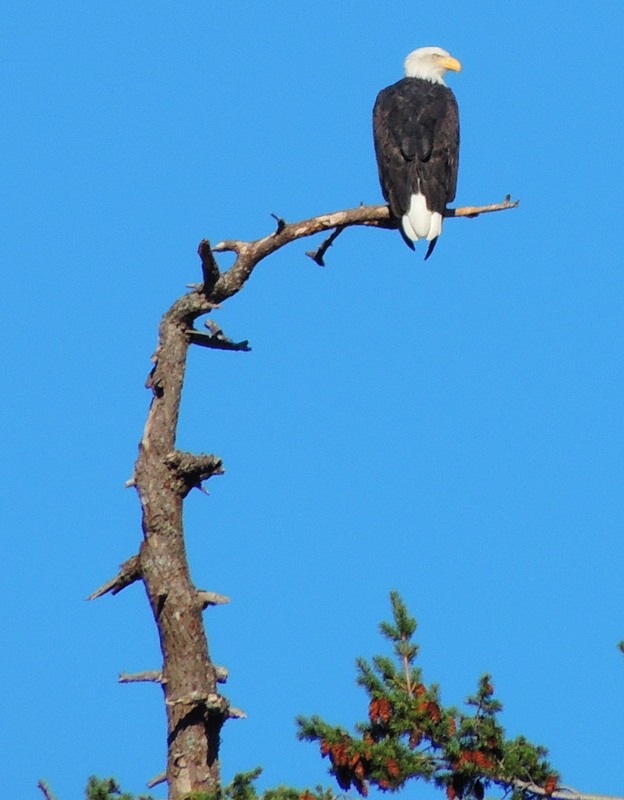 To see the pictures I took of the Wiig eagles and compare them with the BST visitors, click here and read on the next few posts. See also the previous posts by Booni! Today we had an Eagle hanging out in the Nest area, flying from tree to tree, hanging out a while, then flying off again. Finally they seemed to be sitting still for a bit, so i went down to photograph. Of course they were already gone by the time i got there. So i drove around to the Peters* Tree to see if they were there, & they were!